Deputy Sheriff Early Simms of the Blackwater County Sheriff’s Department knows about the violence that incubates within the souls of men – and that sometimes it needs a release. As a high school football player he relished inflicting pain, until he made a tackle that left a promising young athlete dead from a broken neck. Early did not play another game and his dreams of leaving the small town that he grew up in never materialised. Instead, he followed his father into the town’s police force. Now older, Early is outwardly content with the life he has made for himself in Blackwater. But that life is about to be turned upside down. Kate Foley, his high school girlfriend, arrives in town on the run from an abusive husband and it stirs feelings that Early thought he had forgotten. Jimmy and Marshall Cain are brothers – men with the capacity for the kind of violence that Early Simms knows all too well. A botched home invasion by the brothers goes horribly wrong, leaving a man and woman dead and their teenage daughter kidnapped. Events spiral further out of control, with the brothers embarking on a killing spree that leads them to a confrontation with Early Simms and an FBI task force. At the same time, Kate Foley’s husband is armed and on the hunt for his wife. Early is about to find himself in a fight not just for the life he has known, but for the future he has glimpsed in stolen moments with Kate. And to defeat the maelstrom hurtling towards him, he must once again confront the violence in his own soul. Early went to [redacted]'s body and hunkered down in front of [redacted]. His skin was flaccid and his jaw and face swollen and misshapen from the effects of his injuries. His shirt was entirely soaked in blood. 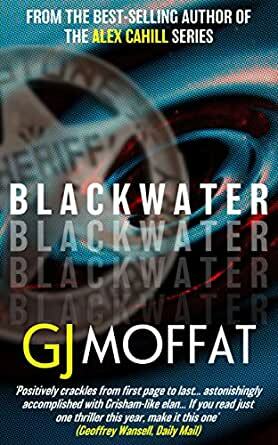 Take Walt Longmire (Deputy Longmire, before Lucian Connally's retirement) throw him into Jesse Stone's Paradise, and then tell a story imbued with the spirit of Fargo (movie or show), your results will be pretty close to GJ Moffat's stunning Blackwater. It's a tale of violence, bloodshed, power, inevitability and death -- what men do. Deputy Sheriff Early Simms of Blackwater County is the son of the previous sheriff and probably the only member of the Department really fit for the job. A tragic accident in High School changed the direction of his life, and as a result he's in the same dying New England area he grew up in. He's made peace with this, and even seems to be happy -- he'd be happier if his boss (and colleagues) cared a bit more about the job and his father wasn't battling Alzheimer's, sure. But this is his life. And then everything changes in a couple of days -- his old high school flame (and love of his life) returns to town, there's an investigation into a corrupt public official, an investigation into an assault/attempted murder at a nearby jail, and a couple of brothers on a killing spree have come to the region. There's also some drug running, spousal abuse, a pretty nasty bar fight. I don't want to say that Early Simms is the only one investigating the crimes, in trying to preserve the peace -- there are three (that we know of) other members of the Sheriff's Department, some other local law enforcement officers and some FBI agents running around. But Early's the only individual who's in each of the stories -- he's the region of intersection in the Venn diagram of Blackwater (and frequently the most capable person around). One of the criminals we meet in these pages (not saying which one) is clearly not an evil man. There's some sort of undiagnosed (by the author or by any professional this criminal has ever encountered) mental health issue affecting him. Which does not lessen the evil he does and the trauma he inflicts on others. Part of me wants to know more about the whys, hows, wherefores, and whatnot about this disorder and is a little frustrated that Moffat doesn't give us any of it. The other part of me is so glad that he didn't succumb to temptation to get into tall that, instead merely showing his readers what was going on with this man, leaving it to us to do the work. There's someone else who probably has some sort of Traumatic brain injury symptoms -- not quite the same, but some of the same results. We also see crime perpetrated by someone motivated by power, money and meanness. Also, there are some criminals who just don't seem to have options, means or inclination to do anything but break the law. It's up to Early to face down these people, no matter where on the spectrum they seem to be found, to prevent them from inflicting too much harm on the community. Moffat can write. That's all there is to it. It took almost no time at all to recognize that. You get a strong sense of every character in just a few lines and his world is as fully realized as you could hope for. He presents the evil Early sees and fights against in this book fairly realistically, in a way that is as capricious and destructive as anything you see on the news. So many times -- almost every chance he gets -- Moffat will do precisely what you don't expect. What people just don't do in this kind of book. He'll put the characters in a situation you've seen dozens of times before, and just when you think "X will happen right after I turn the page," B happens before you can turn the page. I realize there's a danger in saying that -- you'll be looking for that kind of thing. But I expect that the same thing'll happen to you as it did to me every time he pulled the rug out from under me -- you'll get sucked in by his writing and the characters (and possibly still be reeling from the last shock) and you won't even think to expect that he'll do it again. I finished the book I was reading before this earlier than I expected to, and didn't have the next on my list with me, so I took the opportunity to pay a visit to what I call my Kindle's "Fahrenheit Ward" -- where I stick all the Fahrenheit Press books that I buy without time to read -- and I grabbed this. I'm so glad my timing worked out that way -- this is exactly what I needed. I got sucked in by this immediately, and it was practically impossible to put down. Before I got to the novel's final confrontation(s), I jotted in my notes, "Man, I hope this isn't the first of a series -- I don't know if the community can survive another book." But if Fahrenheit published a sequel today? I'd shell out cash before the end day. I strongly expect you'll feel the same way once you recover from Blackwater. It was pretty well written. But it was like a bunch of ideas all strung together really fast, the end. It was like reading something out of a magazine, not like a novel!